These are some of the Questions I will be considering. Are the multiliteracies we desire additive or transformational in nature? Where does disciplinary literacy fit within the multiliteracies paradigm? What happens to meaning-making in multimodal contexts? Are they changing how people think? What happens to academic meaning making in blogs and social network settings? What do the multiliteracies involve exactly? How do they change the relation between creator and audience/readership? Between professional and amateur meaning makers? Do they challenge the university’s gate-keeping and credentializing functions? If they do, is this a good or bad thing for knowledge production and democratic participation? What is the connection between multiliteracies and English? Is there a connection? 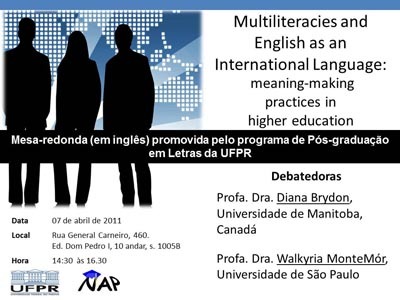 Do the multiliteracies challenge the place of English in higher education meaning-making practices or do they further entrench the primacy of English as the global language of the moment? At the World Social Forum in Dakar, a non-Anglophone participant who was a member of the European parliament told me: “I don’t mind being forced to work in English at the international level, but it is only fair that in such contexts, native-English-speaking participants learn to speak Globish in their turn. That way, the playing field is leveled and communication will be eased for all.” I have a mixed reaction to this idea. Perhaps it depends on what exactly we mean by Globish? What is the difference between internationalization of HE and globalization of HE? Does globalization theory play a hegemonic role “in organizing a particular way of interpreting the world” (46), as Fazal Rivzi claims? If globalization is part of “a politics of naming” (47), as he argues, then what is the relation of that politics to English as an international language and the potential for meaning-making within the multiliteracies? What is the relation between the region, the nation and the transnational sphere in Brazilian higher education today? What is the relation between public and private domains of Brazilian higher education today? Works Cited: Rizvi, Fazal. “Postcolonialism and Globalization in Education.” (2009) In Coloma, Roland Sintos, ed. Postcolonial Challenges in Education. New York: Peter Lang. My thanks to Clarissa Jordao who was a visiting and adjunct associate of the centre from September 2007 until March 2010. Clarissa assisted the Office of International Relations with a Memorandum of Understanding between her university and the University of Manitoba. She is a professor in the Departamento de Letras Estrangeiras Modernas of the Federal University of Paraná and we continue to collaborate with her and other colleagues on the Developing Transnational Literacies Project.